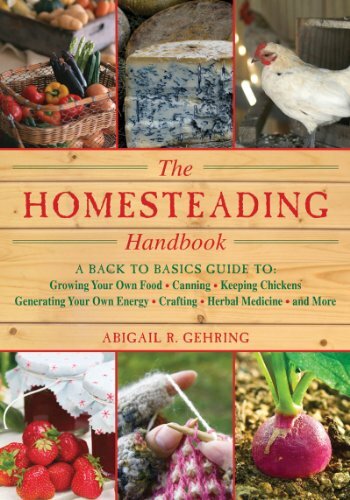 The Homesteading Handbook is your back to the basics guide for just about everything homesteading. It touches on a multitude of topics, giving a basic description and idea for each. If you want to get your feet wet on homesteading ideas and the vastness that can go with it from raising your own garden to generating your own electricity.. this book is perfect for you. This book covers such a vast amount of topics that I was just amazed. It begins with gardening, testing your soil, the right place for a garden and in detail which vegetables work best together, which trees are best for your environment, and even flowers to add to your garden. Pest control, water irrigation, and composting add to the gardeners knowledge. Canning and preserving foods naturally fits in nicely after the gardening topic. The homesteader needs to know pressure times, canning information, dehydrating, freezing information to get started and this book provides a wealth of information on this topic. It even includes recipes for the beginner to utilize. Raising farm animals is another topic that the book covers, small sections on a majority of the major farm animals. If you are looking for a more detailed livestock guide you will want to get a book tailored to the animals you want to raise. This just covers some basic information. A section on barns, sheds, chicken coops, bridges and how to build them is a nice addition to any homestead farm. It gives basic plans and ideas for building which can propel you to design on your own or find a more detailed book specific to the building you want to build. I was surprised to see a section on energy included in the homesteading book, guess I just personally had not given it much thought, but it is indeed a modern day homesteading need for creating your own electricity and energy via windmills, solar energy, and geothermal heat pumps. The Homestead Handbook covers a little bit of everything homestead related. I think it is a great book for someone thinking about getting back to the basics and getting a taste of what it may take to achieve that goal. A new landowner can be exposed to a wide range of possibilities for their land and then be able to pick and choose the ideas that speak to them. They would want then to get a book detailed to that subject. Fantastic beginner guide, and very thorough its sphere of subjects!